Jimmy Nicholl has been appointed assistant to new Falkirk manager Paul Hartley but will combine it with the same role for Northern Ireland. The 61-year-old signed Hartley twice as a player while in charge of Raith Rovers and Millwall. Nicholl will remain Michael O'Neill's number two with the national side as they face a play-off next month to qualify for the World Cup finals. The Bairns assistant said: "It was an opportunity which really excited me." Completing Hartley's back-room team is fitness coach Tam Ritchie, with whom Hartley has worked previously while at Hearts, Alloa Athletic and Dundee. "Things have moved very quickly, but I am just delighted to get started and get back out on the training pitch," Nicholl told the Scottish Championship club's website. "Falkirk is a great club with fantastic facilities and infrastructure. "Any time I have been here previously, I have been very impressed with what I have saw. "There is great potential here and working with Paul, Tam and the players I hope to deliver on that." Nicholl, who has also managed Cowdenbeath twice, has been assistant boss at Dunfermline Athletic, Hibernian, Aberdeen and Kilmarnock. Hartley, who took charge of the Bairns last week after Peter Houston's departure, added: "I am delighted to welcome a man of Jimmy's experience to the club. "He is someone I have enjoyed working with previously and someone who I know will be a real asset to my backroom team. "He has played and coached at an extremely high level and has enjoyed great success throughout his career. "I am certain he will make a really positive impact throughout the club." Falkirk drew 0-0 at home to Inverness Caledonian Thistle on Saturday in Hartley's first game in charge to remain one point and one place above the visitors in eighth place in the Championship. 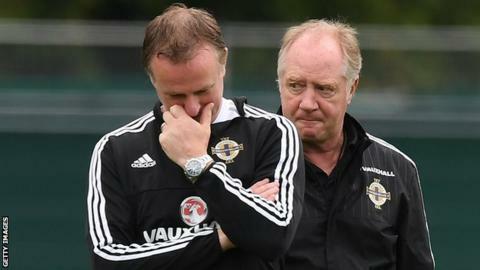 Meanwhile, Northern Ireland and Republic of Ireland will find out their play-off opponents following Tuesday's draw in Zurich.